EDM stands for Electrical Discharge Machining and is a process of removing material by way of burning the substrate with electricity. This process can be achieved in a couple of different ways including wire and sinker styles. A wire will coil through the part and trace a burn in the part, and a sinker style utilized graphite as it plunges into the part. Put simply, the mirror image of the desired part is machined into the graphite and then it is pressed down onto the raw material and burned into it. EDM machines can offer high precision in unique situations. 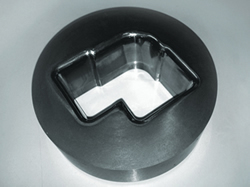 We would be happy to connect with you if you're looking for tooling that might require EDM work!